For centrifugally-cast anodes, there is no need for any sand cores that have to be used in standard die cast anodes. The sand core acts as an insulator and slows the cooling process so that the advantage of a rapid and one-directional solidification is lost and the internal surface of the die-cast anode is practically identical to an inferior sand-cast anode. The centrifugal process allows metal to be poured down a pouring bush into a rapidly-spinning mould and then the pouring bush is immediately withdrawn so that no contact point remains between the anode casting and the supply of molten metal.Only in this way can the centrifugal process eliminate the highly detrimental contact point on the surface of the anode where the metal feed enters the anode, and it consequently results in a metal matrix that is superior to die-cast anodes. If you want your anodes to outperform die-cast anodes and last longer, then buy centrifugally-cast anodes. The centrifugal process uses a mould that is spinning at very high rpm’s. This results in forces on the metal that are throwing it against the walls of the mould under very high pressure. These rotational forces are forcing the metal to be compacted as it solidifies so that the microscopic grain structure of the metal matrix is more compact and more homogenous than die-cast items with sand cores. This grain structure means a longer life for the anode and it eliminates the need for adding additional material to thicken the wall of the anode. The rapidly spinning mould (spinning at over 1500rpm) has pressures greater than 80 times that of gravity and, many times that of Die Casting. The extreme pressure forces the molten metal to the outside diameter of the mould. This dramatic force is intrinsic in ensuring dense homogenous structure throughout the wall section of the casting that cannot be matched by Static Casting or Die Casting. The Microstructure reflects this with Centrifugally Spun Anodes possessing a graphite type AB structure that not only is more uniform but, also smaller so that the walls of the anode are dense, more consistent. Therefore they are not only less prone to breakages during handling & installation but, also measurably more resistant to corrosion when operating. When a Centrifugal or Spun Anode is cast, the feed metal from the ladle is immediately removed so the only metal remaining is for the anode itself. There is no pool of feed metal attached to the casting which would cause differential cooling that is extremely detrimental to the surface area of the Anode at this point of contact. Both Sand Cast & Die Cast methods require a pool of molten metal attached to the anode (In-gate) to slowly “feed” into the anode as it cools freezes & contracts. (The standard contraction rate for Cast Iron including Silicon is 1%). The presence of this “Feed Pool” is extremely damaging to the overall quality of the anode. Specifically if an X-Ray were taken at the In-gate then, it would almost certainly fail X-Ray at Levels 1 or 2. Some Die Cast Anodes which we have X-Rayed have failed up to Level 3. If an Anodes fails Level 2 X-Ray through the wall, centre connection or In-gate Site it should be rejected, because it will fail prematurely. Specifically if an X-Ray or Accelerated Corrosion Test were carried out at the in-gate site then this area would show a greatly increased corrosion rate. This “flawed” area would also be a point from which cracks would propagate and it is a mechanical weak point that should be removed from the surface of the Anode. To date no Die Cast Company has been able to achieve this. Centrifugal Cast Anodes do not require a Sand Core to form the inner bore of the Anode. This single manufacturing difference is critical in understanding why Centrifugal Cast Anodes will last longer than Die Cast Anodes and Sand Cast Anodes. The use of a Sand Core has a dramatic effect on how the molten metal solidifies. Firstly as the metal touches the core, the core causes an immediate or premature “freezing” of the metal at its surface which. This results in a 2 Directional Cooling Structure, one from the Outside of the Anode Inwards (The Mould & the Outer Wall of the Anode) and, one from the Inside of the Anode Outwards (The Core & the Inner Wall of the Anode). For Sand Cast Anodes and Die Cast Anodes that use sand cores the gas & particle impurities that exist within the metal matrix can be pushed from both sides and are trapped as the anode solidifies, resulting in flaws within the walls of the anode. The Sand Core also acts as an insulator, decreasing the solidification rate for the metal within the Anode. As is commonly recognised by all Silicon Iron Manufacturers, a rapid cooling rate gives a superior, finer grain structure. So a system utilises an insulating sand core reduces the cooling rate & reduces the quality of the Anode. The Centrifugal method ensures a superior grain structure as the metal cools rapidly & uniformly from contact only with the spinning metal mould. 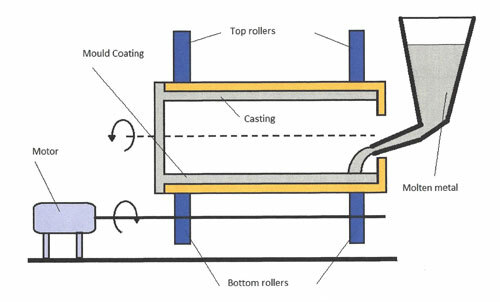 This Directional Solidification is 100% efficient with Centrifugal Cast Anodes because the impurities such as gas and particle impurities are thrown to the inside bore of the anode. This is Stokes Law (the density of the impurities & gas is less than that of the cast iron) and thus, the impurities are not trapped in the wall of the anode. Die Cast anodes may have slight variance in wall thickness throughout the anode length, the thicker the area the slower the cooling rate and thus Directional Solidification is still further exaggerated at these points. The thickest section will be the last to cool & “freeze”, this hotspot will be the weakest & most vulnerable part of the whole casting. Centrifugal Cast Anodes have uniform wall thickness with no hotspots & no areas of vulnerability. In Industry outside the FeSi Business, it is widely recognised that the centrifugal casting technique generates a microstructure and a cast product that is capable of passing more stringent NDT requirements than a Sand Cast or Die Cast alternative. For FeSi anodes if you require a superior structure, request an X-Ray to ensure the anodes are fit for purpose.